Oh Halogenated Flame Retardants. She’s a killer hiding behind a mask of good intention. Relaxing in our homes all day, every day, then running in, pretending she can stop a fire! Save children! Keep your lit cigarette from setting your mattress ablaze! But let’s be honest, HFRs is a mess — a hot mess. She’s so clingy and needy, hanging on everything and getting all up in your business, covering you and anything that crawls from babies to kittens. Laying your head on a HFRs laced mattress or couch can be toxic to your brain, endocrine and reproductive systems and has detrimental effects on your thyroid and liver function. “Snap, did I do that?” Yes, HFRs, yes you did. HFRs shows up in car seats, strollers, nursing pillows, cribs and sleep positioners and leaves a trail of toxic footprints in her wake. Like Wonder Woman, HFRs’ producers have tried various makeovers to reinvent her image over and over again — PBDEs, Tris, FireMaster 550. But she’s still the same old HFRs underneath all of that hair dye and spandex. When a fire does catch, she’ll fill the place with smoke and toxic gasses, and you’ll be lucky to escape. As soon as HFRs spots those hunky firefighters on the scene, she is all too happy to cause a hot mess for their health too. In October 2011 she was awarded a well deserved spot on California’s Proposition 65 for her role as cancer causing Tris. Chemical compounds containing chlorine or bromine bonded to carbon, structurally similar to Dioxin. 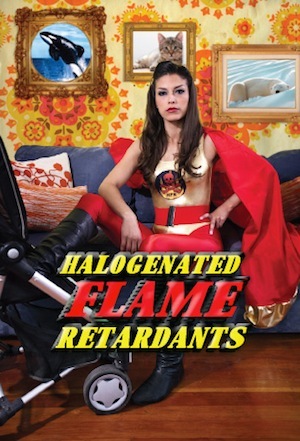 Halogenated Flame Retardant (HFR) has re-invented herself time and time again. Since the passage of the Toxic Substances Control Act in the 70s, she’s made a comeback in many electrical applications as PBDEs, or polybrominated diphenyl ethers, and now under new stage names such as Firemaster 550, Green Armor, and Emerald 1000. HFRs are found in many baby products, including car seats, strollers, nursing pillows , cribs and sleep positioners. With HFRs found in human breast milk and in umbilical cord blood, it is suggested that mothers pass down these toxic chemicals to her children during key developmental stages. Although best known for their classic roles, hitting home in the foam of furniture, curtains, televisions, and carpets, these old-timers are especially fond of the younger generation. One type of Halogenated Flame Retardant, PBDEs, are found in 97% of the nation, with the highest levels in young children. Chlorinated Tris, an HFR removed from children’s pajamas in the 70s because of its toxicity, has now found its way back into sofas and baby products. HFR has demonstrated toxicity to the brain, thyroid, endocrine and reproductive systems, and can cause cancer. Studies show that that some HFRs may be delaying conception in women, while other studies show links to lower IQ and developmental disabilities in children. With American babies born pre-polluted, HFRs have had an easy career by capturing their audience early on and accumulating over the years. Not all can have lifetime fans! Two kinds of PBDEs, pentaBDE and octaBDE were phased out in 2004, and The Environmental Protection Agency announced the phaseout of decaBDE, the third and most widespread PBDE, by the end of 2013. As decaBDE’s popularity waned, companies have phased it out. For example, computer and TV makers such as Sony, Samsung, and Phillips already meet the highest fire safety standards without decaBDE. Furthermore, fire fighters are calling for a decaBDE phase-out. In March 2011, retail giant Walmart gave PBDEs two thumbs down and stepped up their corporate game by banning this chemical from their consumer products. Maine, Washington, Oregon, Vermont and Maryland have already banned PBDEs. The following states have pending legislation to limit the use of harmful PBDEs: Alaska, California, Connecticut, Hawaii, Illinois, Michigan, Minnesota, Montana and New York. New York also has pending legislation to ban chlorinated tris from baby products. Halogenated Flame Retardants have two main agents with lots of talent: the Bromine Science and Environmental Forum and Citizens for Fire Safety. They will spare no expense and stop at nothing to aggressively promote their top earners across the globe, spending millions in just one quarter in Sacramento alone. As long as there is raw bromine talent to mine, they will continue to work hard to wrestle every last dollar in revenue from their stable. The American Chemistry Council has promoted and defended HFRs, and recently formed the North American Flame Retardant Alliance.